The two bright “stars” in the western sky this evening are Venus and Jupiter. Venus is the brightest starlike object in the sky, although it shines by reflected sunlight. It is over six times brighter than Jupiter, which appears higher in the sky and farther south. The separation between the pair is about 38 degrees and decreasing quickly. Venus is rapidly moving eastward compared to the background of stars. 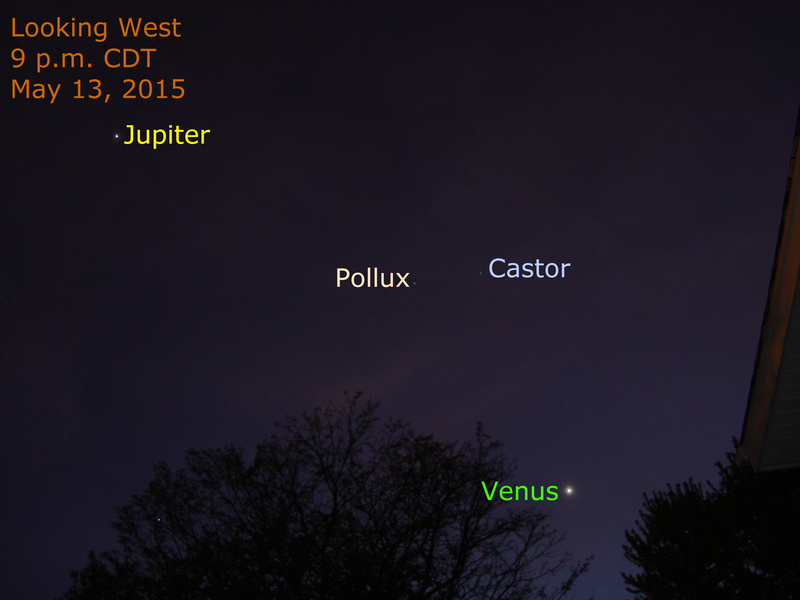 During the next week watch Venus move closer to Pollux and Castor, the Gemini Twins. By the end of June, Venus and Jupiter appear as a brilliant celestial pair in the western sky.